Mission accomplished, folks. Sony's worldwide studio president, Shuhei Yoshida, took to Twitter to address the PS4 movement to keep the system from embracing any anti-consumer means of DRM as well as to keep the PS4 from having used game fees attached like the Xbox One. The trailer for DRM is above. I'm sure the Inquisitor will be pretty curious why all of a sudden a huge amount of hits went their way for Death Ray Manta as more and more sites cover this and the news goes viral. 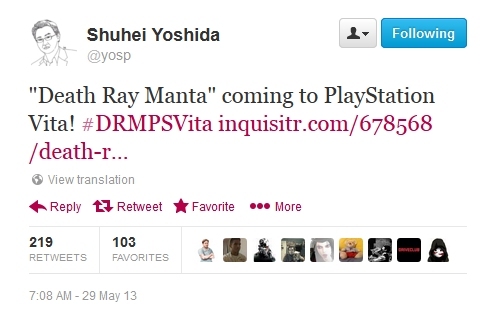 Anyway, Yoshida has found a way to turn a very serious and consumer-detrimental situation into troll bait. Nice going, Yoshida. On the flipside of the coin, NeoGaf has gone and turned into the forum board version of the Road Warrior, trampling down viral marketers, Xbox fanboys and anti-consumer trolls like they were thong-wearing desert raiders...deserving nothing short of a textual beatdown, just like the Interceptor unleashing some mean justice on some poor-arse V6 scrapheaps on the road. The link above contains a huge list of all the movers and shakers in the gaming industry; everyone who could possibly help make the effort of keeping DRM out of the PlayStation 4. NeoGaf's remonstration to stamp out the PS4's potential DRM measure started a few days ago when they tried rallying any and everyone worth their salt in the gaming industry to Tweet #PS4NoDRM and #PS4USEDGames, hoping to get the hashes trending on Twitter and to bring awareness to other gamers, casuals and anyone else in between to join in on the effort. I don't know anyone else out there that isn't Jay Wilson, the board of directors at Electronic Arts or the executives at Microsoft who would want DRM stamping out rights and gardening off gaming from gamers like it was some sort of commerce concentration camp. 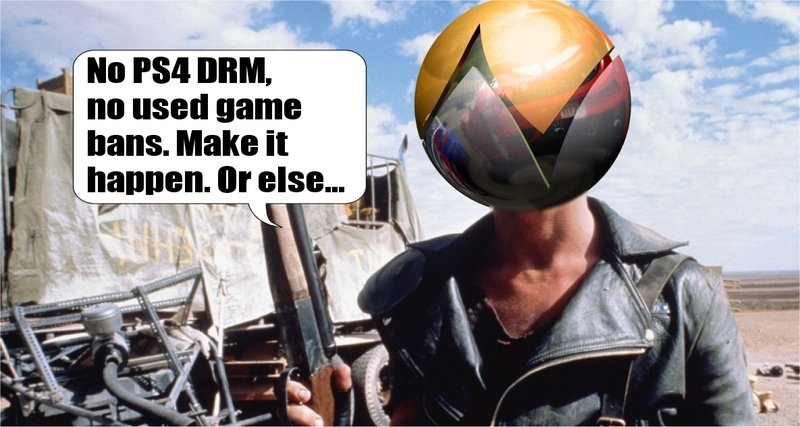 Anyway, you can still keep the movement going and letting Sony know that you want a DRM-free PS4 future. Just remember to do so in a polite but sincere manner. And just so you know...Microsoft is also listening.